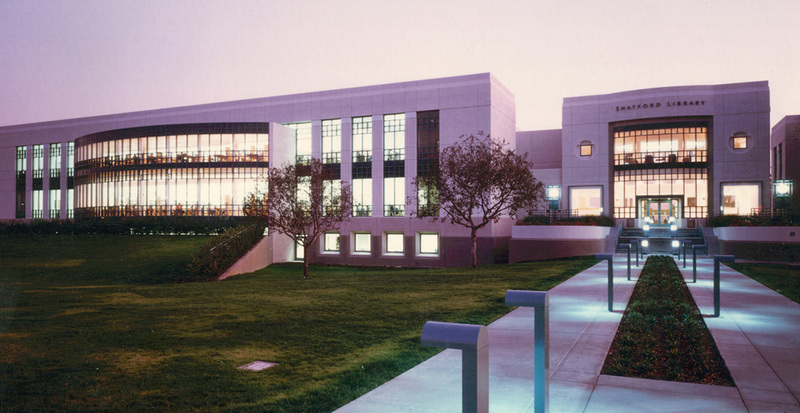 Gruen Associates was the Architect for the Pasadena City College Shatford Library. The 90,000-SF, three-level library is carefully integrated into the campus plan and draws from the context of the surrounding area to be in harmony with its overall scale and fabric. A two-story high bow window projecting from the north arcade admits north light to the reader areas within the library. The rotunda at the juncture of the library and campus core buildings contains a reading room and with its glazed façade acts as a lantern at night. The second and third floors and portions of the first floor are utilized for the library. Microfilm is stored on the ground floor. The balance of the first floor is for Media Services and contains audio visual and broadcast activities. The siting and exterior design of the library responds to various external considerations including consolidation of the northeast quadrant of the campus, strengthening of the east-west and north-south pedestrian paths, and formal relationships to the historical campus core. The design also capitalizes on views of the San Gabriel Mountains to the north, and addresses the civic importance of Colorado Boulevard. A spacious plaza and sculpture garden were designed to be a contemplative reading and relaxing area and have become a major green space for the college. Gruen also prepared a revised master plan in conjunction with our design of the Shatford Library and the development of a plan and program for the campus Physical Education Facilities/Gym Building.